When I was eight years old, I was playing with the suction cup at the end of my toothbrush. I tested which surfaces it would stick to, the door, the windows, the walls, anything I saw. I demonstrated this awe-inspiring find for my father by attaching the toothbrush to the mirror hung in the hallway. I did not expect what would happen next. When I tried to pull the toothbrush off the mirror, the mirror fell with it! I squeezed my eyes shut, terrified for the impact. There was a thunderous crash, and I tentatively opened my eyes. I was to the side, next to my father, not where I was standing before. But I hadn’t moved! Glass shards were littered on the ground, and the toothbrush was still in my hand. I can only speculate what could’ve happened to my brain if that heavy mirror would’ve shattered on my head. Miraculously, there wasn’t a scratch on me. Moments like these are impossible to explain logically. Even my eight-year-old-self understood there must be angels protecting me. Even if you don’t believe you are deserving of its conservation, it is there to help you. This angel was with you since your birth, and will be there to transition you the next world. It stays with you always with unconditional love, ensuring you are safe and guided. Visionaries view this being’s aura as being bright white. It’s important to be in tune with your inner prompting to do the right thing. They could be your guardian angel guiding you to your correct path in life. What Is The Name Of Your Angel? Your guardian angel has a name which you can use to call upon it at any time. If you don’t know the name, it’s very easy to find out. 01: Find a quiet place where you will not be disturbed for a few minutes. 02: Sit straight on a comfortable chair with your feet flat on the floor. 03: Take off any article of clothing that binds you, like jewelry, belts, and shoes. 04: Relax and take deep breaths. If it helps, close your eyes. Inhale, taking in everything you want. Exhale, expelling anything undesired. 05: Begin to count your breaths. When you reach 20, ask the guardian angel his or her name. Silence your thoughts as you wait for an answer. You may receive the name in a picture, thought, feeling, or even an audible voice. 06: If you don’t apprehend anything, ask the angel to speak a little louder. The most common way to obtain the name is through a thought. If a name pops into your head during this exercise, don’t think you made it up. 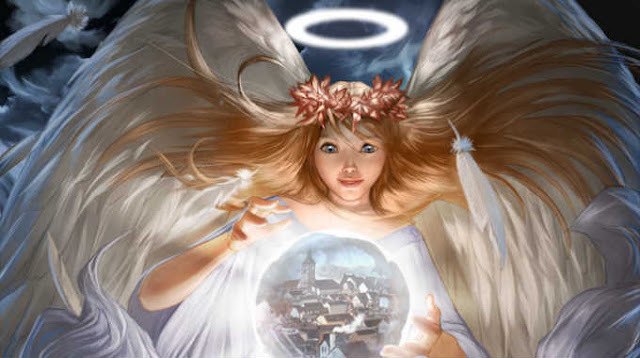 Your guardian angel is telepathically communicating with you. Accept whatever you receive, the first name that comes to you. Even if the name sounds strange to you, accept it. Angels are named by G-d and their title can reflect their purpose. If you doubt the name that you heard, request a sign from your angel to confirm it. Your angel wants you to know its name. All you need to do is ask. Your angel always has been and will be there for you. Many instances occur, and we don’t even realize they were protecting us. Yesterday I was lost and trying to check a map as I was hurrying to work. Suddenly I found myself on the crosswalk of a busy intersection. I looked up, wondering why the walking sign wasn’t on. In shock, I realize the light was green! I ran to the sidewalk, laughing at myself for being such a fool and reveling at the miracle that I wasn’t hurt. We all make mistakes, gloriously dumb mistakes. They are part of being human. The angels are there to make us realize where we are and to gently steer us back to the sidewalk, to the path where we belong.